"A powerful, square-jawed, hollow-eyed David Hess is mesmerizing in the title role. So intensely felt is Hess' performance, and his embittered "The Barber and His Wife" and unsettlingly sweet "Pretty Women" are as pitch-perfect as they are entrancing." "Hess exposes the tormented soul of the serial killer. A magnetic anti-hero in a black leather jacket, he caresses his straight-edge razor like a lover, cooing "you shall drip rubies." The heart-pounding propulsion of his "Epiphany" charges the impending acts of violence with a distinctly sexual edge." "David Hess' Sweeney swings terrifyingly between normalcy and derangement, his ravishing voice ever hinting of private torments." "David Hess gives Sweeney Todd a truly frightening grin - his air of barely contained destructive fury served to underscore the demon barber's frightening hunger for vengeance." "David Hess' portrayal of the title role assures authenticity and success. He is "scary-good" in his presence and singing ... Hess does well with what is the most important aspect of musical performance: he communicates." "David Hess' Todd is sublime. His baritone is lush, but his interior life as Todd is layered and tortured. When he sings "Epiphany" at the moment he realizes what he must do to exact his revenge, it's like a cloud washes over his face and a different personality emerges. Through it all, he is able to capture the audience's sympathy. Yes, he is awful. But somehow so right, too. He is magic to watch." 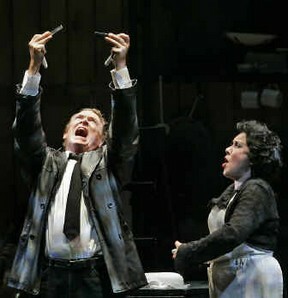 "David Hess gives a riveting performance as the impassioned Sweeney Todd. His pitch perfect powerful voice is astounding in the duet with Judy Kaye, "A Little Priest." He has a lush and appealing baritone voice and sings the role with all the fervor it requires. He becomes frightening as Todd proceeds to become demented in the second act." "The richness of Hess' and Judy Kaye's voices, plus, more tellingly, the layers of wit that they convey so clearly, bring an intelligence and emotion to this production. Even with -- maybe because of -- their characters' pathological actions, Hess and Kaye (who plays Mrs. Lovett) summon little twisted smiles, like winks, cluing us in that the flames of mayhem and heartbreak needn't singe a healthy sense of humor." "David Hess' portrayal of the killer barber allows a sense of the broken human beneath the mad murderer. His strong, confident singing was light and wistful when he longed for his old life with his wife and turned chilly and haunting in the excellent "Pretty Women." "Sweeney, played by the imposing David Hess, shows us that even sociopaths have tender hearts when he thinks of his daughter. Hess is tall and charismatic and finds a way to charm us even as he puts off repellant killer vibes. It's possible to sympathize with Sweeney up to a point, but he's a not a remorseful guy. Hess and many of the supporting players are veterans of the Broadway production. As you might expect, their work is flawless." "David Hess shapes Sweeney less as an agent of revenge and more as a man consumed by his circumstances - it's a wonderfully intuitive performance, making his Sweeney less one-note than in past interpretations. His rapport with Kaye is masterful - funny and, as mentioned, earthy." "Hess is a strong baritone with a vaguely hangdog air about him, a Sweeney you wouldn't necessarily peg as a man about to snap. Until, that is, he gets his hands on those razors, misses a key opportunity and then quickly goes bonkers over the course of the song "Epiphany." Other Sweeneys (Johnny Depp most notably) go for bombast. Hess' Sweeney is a stealth killer." 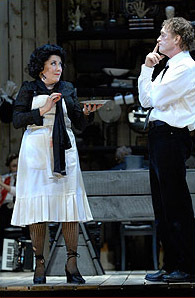 "Since the original cast is almost intact here, I won't repeat what's been covered, except for a few observations but, first of all, a tribute to what the New York production didn't have: David Hess as Sweeney Todd and Judy Kaye as Mrs. Lovett. Hess is a tall, loose-limbed performer whose whole body imitates the sweeping gestures of the murderous barber. His portrayal is demonic and daffy. Both he and Kaye give the ghoulish pair playfulness and purpose. Both Kaye and Hess project the pain and tragedy of the demon barber, devastated by loss and 15 years in prison, and the woman warped by loneliness and poverty who becomes his perfect partner for a brief and bloody while." "As Benjamin Barker, aka Sweeney Todd, David Hess chooses an interesting interpretation of the menacing barber with a seemingly endless score to settle. His incarnation of Todd is an anguished man who lumbers around the stage, with his physical presence an extension of his beaten down soul. He is often clumsy and cumbersome; yet when his beloved razor is in his grip, he is masterful ... How many slasher films have you seen where you felt empathy for the slasher?" "Hess is from the outset a distressed and disturbed Sweeney, a man who becomes more deranged with each setback to his grand plan for vengeance. He and Kaye play beautifully off each other, generating enough sexual energy to re-stoke the fires in Mrs. Lovett's bake house." 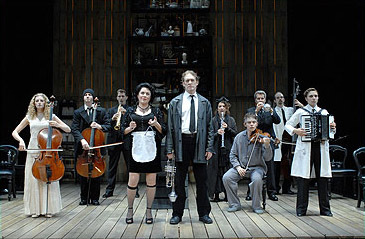 "Hess' Sweeney would be almost heroic, if he weren't so scary. Understandably disillusioned, he's so single-minded in his quest for revenge against the corrupt judge who exiled him, raped his wife and stole his daughter that nothing else seems real to him, not even the murders he commits." "As Sweeney, David Hess offers a commanding, foreboding presence, his off-kilter walk a constant reminder of the character's fragile hold on sanity. His Sweeney is dark, focused and (of course) obsessive." 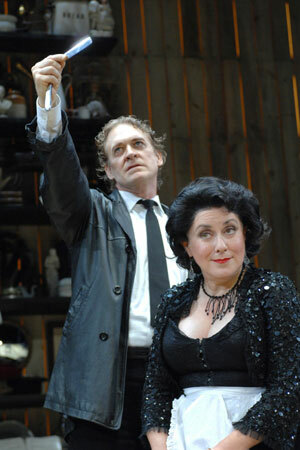 "David Hess and Judy Kaye star in the production and both deliver memorable performances. Hess plays the title character with a slight hunch, both in his back and his soul. His Sweeney simmers for a long time before boiling over into murderous rage, an approach that gives this slasher a measure of humanity." "The naturally gentle David Hess -- superb here last season in the Marriott's Shenandoah -- makes a tortured, gut-wrenching Sweeney." 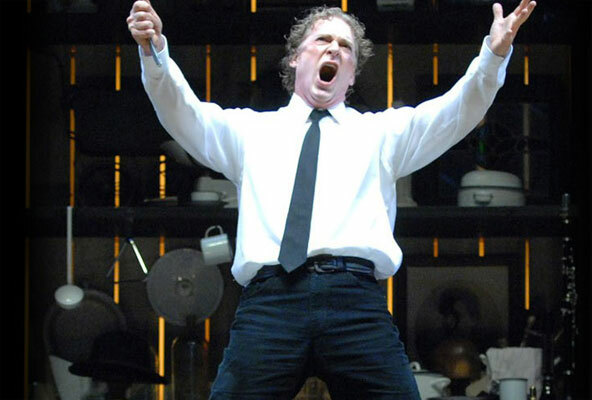 "In the title role, David Hess projects intensity and burning rage, prowling the stage like a caged beast. With his haggard air, he seems to have been put through the wringer." "David Hess plays Sweeney not like some great Sweeneys of the past -- the over-the-top, sadistic lunacy of George Hearn comes to mind -- but as an ordinary man driven mad by grief. That approach made Hess a notably sympathetic Sweeney." "David Hess and Judy Kaye replaced big names Michael Cerveris and Patti LuPone in New York, and they are a terrific pairing. Hess shows both the tragedy and a nicely warped sense of the absurd." "David Hess, as the revenge-thirsty razor-wielding barber, could give Johnny Depp a lesson in how to be truly frightening even though it might risk masking the character's likeability."